Butler Speedway and Engine Pro Sprints On Dirt presented by ARP have jointly developed rules requiring all sprint cars racing with them to have full containment seats next season. Butler and SOD have created the new, common seat rules in an effort to make compliance easier and practical for competitors. Every effort has been made to make the rules similar to those already in place for other tracks and series. Most competitors already use the seats, but in light of serious injuries and deaths that may have been decreased or even prevented through the use of the seats, the time has come to make them mandatory. The seat rule is in effect immediately; there will be no phase-in period. In addition to the full containment seat requirement, both Butler and SOD will also strongly recommend the use of head and neck restraint systems in 2018. Click on the Competitor Info tab to access the 2018 Sprints On Dirt rule book. The seat rule is section 2.2 in the book. Are you ready for the 38th Annual SOD Awards Banquet? As announced a few weeks ago, the 2017 Engine Pro Sprints On Dirt presented by ARP Awards Banquet will take place at the Battle Creek (MI) Holiday Inn on Saturday, November 11th. The top 12 finishers in season points will receive a portion of the championship point fund as well as contingency products and awards if they attend the banquet. Thomas Schinderle will be honored as The Perfit Corporation Sprints On Dirt Series Rookie of the Year for the top finishing driver who has previous sprint car experience, but ran their first season with Sprints On Dirt. Andrew Scheid will be honored as The Perfit Corporation Sprints On Dirt Sprint Car Rookie of the Year for the top finishing driver who is a first-year sprint car driver. The XYZ Machining Crew Chief of the Year and the XYZ Machining Sportsman of the Year will also be announced and honored at the banquet. 2017 points money consists of the season championship point fund, the MAHLE/Clevite Beyond Limits Challenge, the King Engine Bearings King of Michigan, and the Driven Racing Oil Battlegrounds Bash. The top 5 finishers in each of the 3 season mini-series will also be recognized at the banquet. The MAHLE/Clevite Beyond Limits Challenge, SOD’s original mini-series included races at Baer Field Motorsports Park, Thunderbird Raceway, Merritt Speedway, and Crystal Motor Speedway. 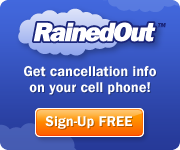 A BLC race was rained out twice at Manistee County Fairgrounds and not rescheduled. Steve Irwin won the championship, followed by Thomas Schinderle, Gregg Dalman, Chris Jones, and Robert Bulloch. The King Engine Bearings King of Michigan series was contested at Hartford Speedway and won by Chad Blonde, followed by Steve Irwin, Gregg Dalman, Thomas Schinderle, and Ryan Ruhl. The Driven Racing Oil Battlegrounds Bash series was run at Butler Speedway and Thomas Schinderle took the championship over Joe Swanson, Chad Blonde, Jay Steinebach, and Steve Irwin. Everyone is invited to attend the banquet. Tickets are $35.00 per person and must be purchased by October 30th. For full banquet information and to order tickets, click here. Would you like to sponsor a trophy? Call 734-309-RACE (7223) or email director@sprintsondirt.com for more information. Engine Pro Sprints On Dirt presented by ARP is brought to you in 2017 by many important sponsor partners including: Engine Pro (Title Sponsor), ARP (Title Sponsor), Hoosier Racing Tire (Official SOD Tire), MAHLE/Clevite (Beyond Limits Challenge Sponsor), Driven Racing Oil (Battlegrounds Bash Sponsor), King Engine Bearings (King of Michigan Sponsor), Lane Automotive/MSD Ignition (Fast Masters Sponsor), Engler Machine & Tool (Heat Race Sponsor), COMP Cams (Heat Race Sponsor), RockAuto.com (Heat Race Sponsor), The Perfit Corporation (Lucky Dog Sponsor), KSE Racing Products (Hard Charger Sponsor), XYZ Machining (Season Sportsman & Crew Chief Sponsor), Jim Coffey & Son Plumbing & Heating. In addition, SOD contingency sponsors include: Allstar Performance, ATL Racing Fuel Cells, BR Motorsports, Diversified Machine Inc. (DMI), K2W Precision/Keizer Aluminum Wheels, King Racing Products, Kistler Racing Products, Maxim Racing, Motor City Racing Promotions, Racing Optics, Rod End Supply, Schoenfeld Headers, Simpson Racing Products, Walker Performance Filtration. 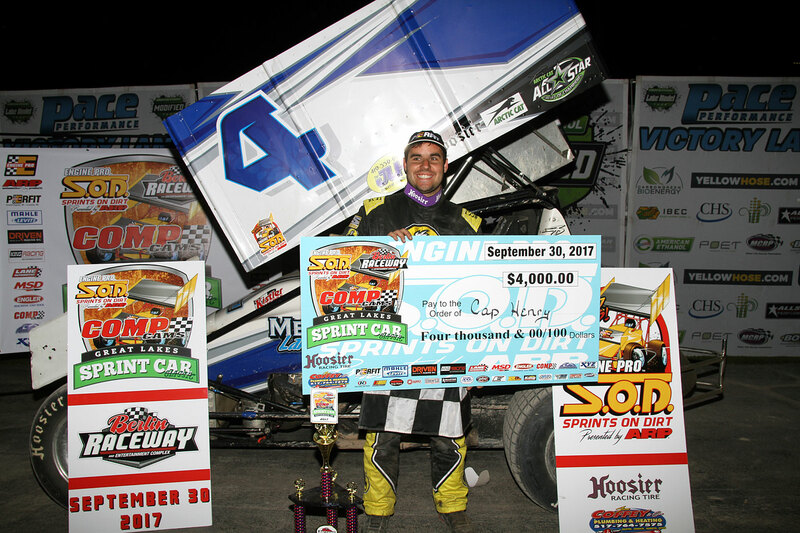 Cap Henry drove his Lane Racing, Kistler-powered J&J to victory in the Engine Pro Sprints On Dirt presented by ARP COMP Cams Great Lakes Sprint Car Classic before a huge, enthusiastic crowd at Berlin Raceway Saturday night. Henry started 4th and wasted little time getting to the front, taking the lead on lap 3. Henry drove to victory over Ryan Ruhl and Jordan Ryan. While Henry looked untouchable, Ruhl was closing in on the leader quickly at the end, but ran out of laps. Ruhl dropped to seventh from his fifth place starting position, but came to life late in the 30 lap feature and finished just 0.6 seconds behind Henry. The only caution came out on lap 11 for a Thomas Schinderle flat tire; he rejoined the field after changing the tire. 2017 SOD Sprint Car Rookie of the Year Andrew Scheid finished 7th to win the KSE Hard Charger Award for advancing 7 positions. Heat races were rough. Veteran Mark Aldrich caught the front straightaway wall in the 1st heat and did a series a hard flips to put an end to his night. Jared Horstman clipped a turn 3 tire marker in the 2nd heat and flipped, bringing his night to an end. In the 3rd heat, Brett Mann made hard contact with a tire marker in turn 2, destroying his #19. All drivers were okay. The well-prepared temporary Berlin Raceway dirt surface held up extremely well under the pressure of a big program of 28 SOD sprints, 28 AELMT late models, and 30 AEMODT modifieds. The CCGLSCC closes an exciting 2017 Engine Pro Sprints On Dirt presented by ARP season. 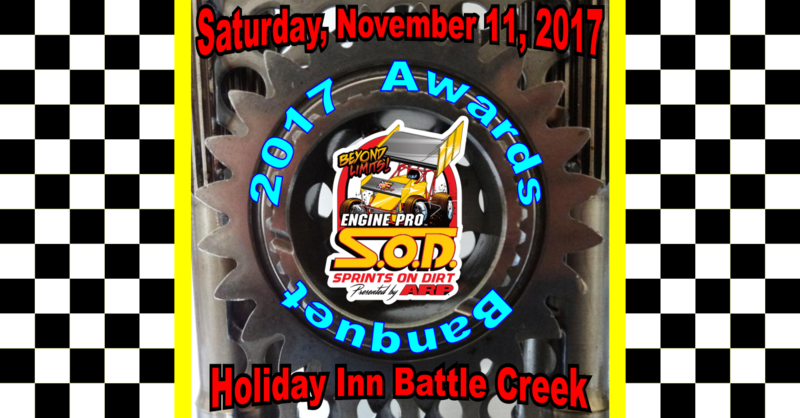 Next on tap is the 2017 awards banquet that will be held Saturday, November 11 at the Battle creek Holiday Inn, Battle Creek, Michigan. For more information about Engine Pro go to www.enginepro.com. For more information about ARP, go to www.arp-bolts.com. The full 2017 Sprints on Dirt schedule, rules, current news, and other information are available at www.sprintsondirt.com.